Pleated Patio Awnings run on a guide wire or track system that is easily extended or retracted by a rope and pulley and are designed to fold up under eaves. 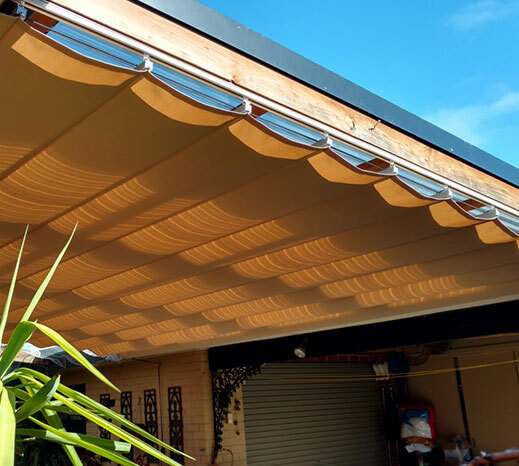 Pleated patio shades are a retractable shade screen blind that is placed under your existing pergola and runs along aluminium tracks or stainless steel cables. Pleated patio shades are known for withstanding the elements well, and are often used to shelter outdoor areas in cafes or to cover carports. Not to mention, pleated patio shades also add a touch of style to your outdoor area, thanks to the design and patterned shadows created.